Ken Forrester and his wife started their winery together with their young family; Buying a large 38 ha plot of land in the Stellenbosch region of South Africa, and working with farmers over 90 ha of scattered parcels. Ken wanted to produce the best wine in the world and has been working with the Chenin Blanc grape to try to achieve that goal. He is doing very well with Chenin Blanc and may be viewed as one of the Chenin experts in the world. Ken Forrester grows all their fruit on the estate. They farm organically with the thought toward social responsibility. Not wanting to put chemicals on the vines which can ultimately be bad for the environment. Ken feels that 80% of a wine’s quality comes from the vineyard, so he treats the vineyards very well. When it is time for harvest he hires people to help hand harvest the grapes. Fruit-driven wine is top of his mind, so he keeps oak contact to a minimum. All the Chenin Blanc wines are also fermented using indigenous yeasts. 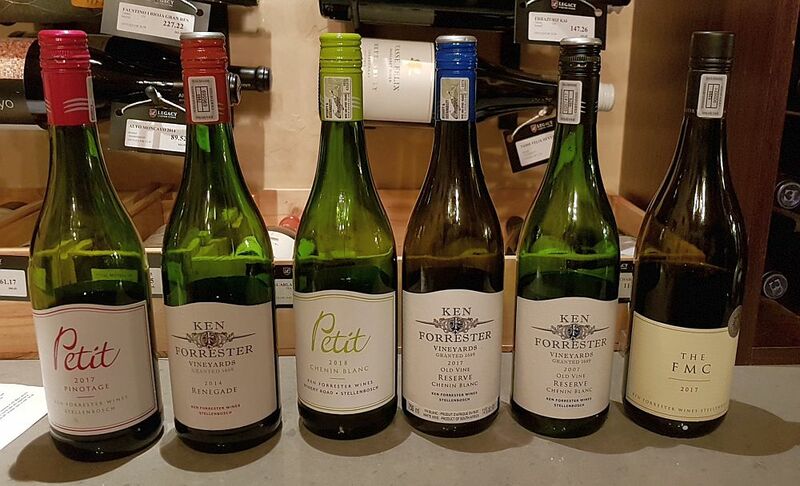 I was fortunate to be invited to a small group tasting of some of Ken Forrester’s wines, which included a sparkling Chenin, 4 still Chenins, a Pinotage, and a red blend. 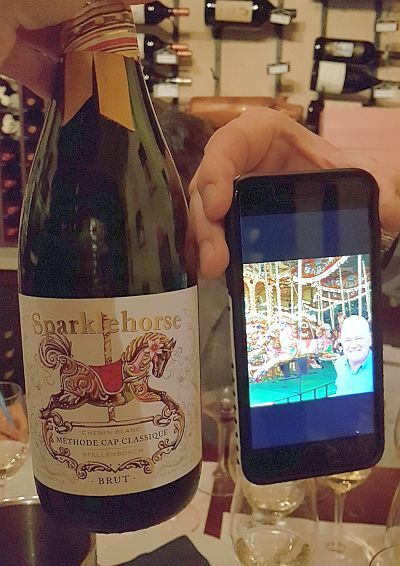 Sparklehorse Chenin Blanc, Méthode Cap Classique Brut, 2015, WO Western Cape – Cap Classique is the term used for sparkling wine in South Africa; this one is made from Chenin Blanc of course. It takes 3 years from fermentation to bottling and second fermentation and further aging before this wine is released. The grapes come from a very specific location within his vineyard that has a concave surface, where the soil is colder and wetter and slows the ripening of these grapes and leaves them with higher acidity. The label for this wine also has a story. It shows a carousel horse that Ken saw on one of his trips. He took a picture of himself in front of the carousel with one of the horses. This horse, drawn exactly the same by an artist, except pointing the horse in the opposite direction, is what you see on the Sparklehorse label. 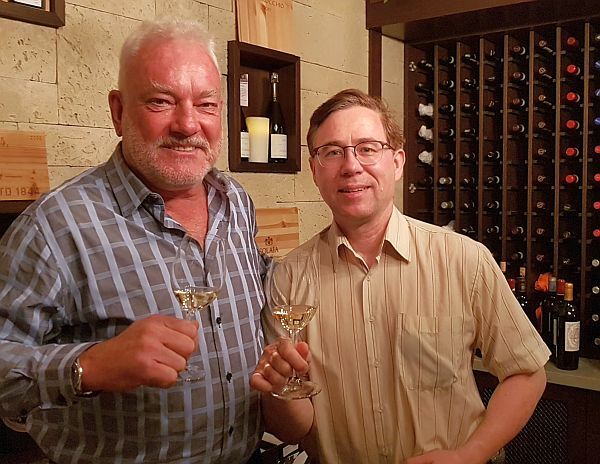 Petit Chenin Blanc 2018, WO Western Cape – One of Ken’s larger production wines that go around the world. It is a bright, light lemon colour. Interesting aromas of green fruit, pine needles, oranges and lemon skin. Dry, medium plus body and acidity, and a thicker mouthfeel. Light fruit flavours of apple, green fruit and pine needles. Some minerality and waxiness to this wine. Hints of orange and peach. You also pick up a hint of dusty tannins on the finish. Old Vine Reserve Chenin Blanc 2007, WO Stellenbosch – What does an aged Chenin Blanc taste like? We indeed had the opportunity to try this wine and find out. The wine was a deeper pear skin colour. White wines do get darker in colour with age. The nose was more pronounced with aromas of oak, beeswax, ripe citrus and a hint of vanilla. Full body, round, with medium acidity. Very tasty with flavours of ripe apples and pears, and honey/marmalade. Thick mouthfeel. It finished with ripe fruit, pear skin and some sweet spices. Longer length with lingering apple flavour after the other flavours faded. Very good. Petit Pinotage 2017, WO Stellenbosch – This is a single vineyard wine made with 100% Pinotage grapes. Pinotage may be said to be the signature red grape of South Africa, as Chenin Blanc is for white grapes. He puts in lots of effort into this vineyard to produce the quality wine that we tasted. Ken noted that Pinotage needs even ripeness and as such the grapes are picked over several days in order to get all ripe fruit for crushing, cold soaking, then quick fermentation. This wine has a deeper ruby colour, and wonderful red fruit and raspberry aromas. It has a juicy red cherry, plums and other red fruit flavours with make it seem off-dry, but it could just be the fruitiness of this wine. The wine is very smooth with soft tannins and medium acidity. I also picked up some minerality to this wine and pepper on the finish. It finished with tart red fruit flavours. Renegade Red 2014, WO Stellenbosch – This wine is made from a blend of Grenache, Syrah, and Mourvedre; a southern Rhone blend. Ken noted that Rhone Valley grapes do well in South Africa. When he makes this wine each of the three grapes are fermented separately and aged in large 400-litre neutral oak barrels for 2 years, before blending. Ken has a philosophy about how to create this particular wine. He views the wine as an inverted pyramid with the top being Grenache, giving the wine red fruit flavour. Next mid-way down the pyramid to support the Grenache is the Syrah which adds the spice, like nutmeg and black pepper. Lastly at the point of the pyramid, providing dark base tones to the blend is Mourvedre. The FMC, 2017, WO Stellenbosch – This is the pinnacle, iconic wine for Ken Forrester. The Chenin Blanc grapes for this wine come from a single vineyard that was planted in 1970 as bush vines that are goblet pruned. The grapes are picked over 5-6 different days in order to get the grapes at their best ripeness. Each picking is fermented on its own. Ken tries to avoid malolactic fermentation of any of his barrels of wines, but if he happens, then he rolls with it. After fermentation the different barrels are blended. In some cases some of the barrels will be sweeter as that wine had a stuck fermentation so it did not ferment dry. This sweeter wine is blended in with the dry wine to fill in the gaps in the wine, and make it rounder. 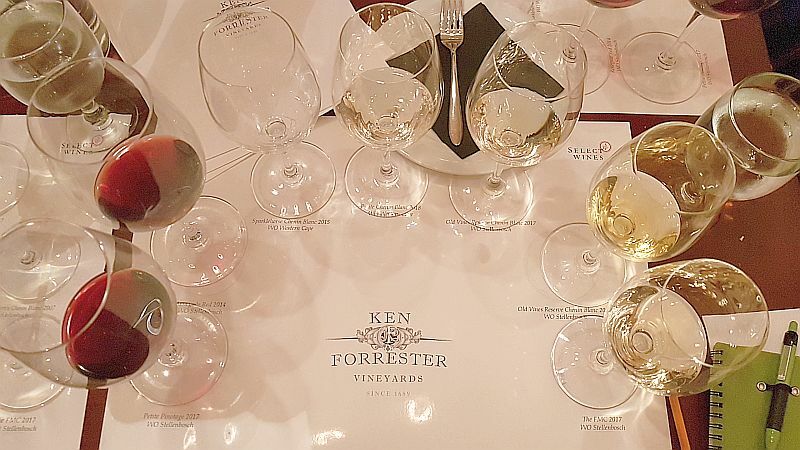 Where Can I Buy Ken Forrester Wines? If you have not tried Chenin Blanc wine before, please give it a try. Chenin Blanc is a very food-friendly grape. The Ken Forrester Old Vine Reserve Chenin Blanc 2016 is available at BC Liquor stores. Part of this tasting is to get feedback from myself and other Trade people about these wines. I really enjoyed these wines, as I know the others did as well, so I hope these other wines will arrive soon in our market. If you are in Quebec, the SAQ has all these wines plus more from Ken Forrester. You are very lucky.